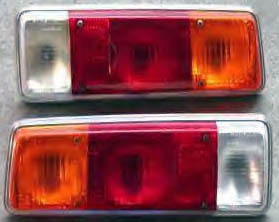 New Old Stock (NOS) Carello Group 4 and European Amber Taillights are available. We have only limited supplies of these rare items. Some vendors offer reproductions of these for the same price as we are offering the orignials. Each pair includes the buckets, the lenses, and the wire looms. Due to shipping from Europe, it make take several weeks to receive these items, although the group 4 lights are usually in stock.